Low Carb, Keto Friendly, Grain Free Triple Layer Coconut Cake. Also makes a double layer 9 inch cake or 24 cupcakes. 1 cup coconut flour plus more for dusting pans for preparation. Prepare 3 six inch pans with oil or butter. Add a little coconut flour to each pan. Beat whites until they form soft peaks that stick to the spoon but not all the way to stiff. If using your kitchen aid mixer transfer to a cold bowl. Set aside. Clean mixer and mix oil, coconut milk, egg yolks, vanilla. Mix all dry cake ingredients together in a bowl. Set aside (coconut flour, baking powder, salt, xanthan gum, swerve). Add the dry ingredients to this mixture. Add in liquid stevia. Mix well. Bake for 20 to 25 minutes at 350 degrees F. Check at twenty minutes. You want the cakes to be golden brown. Cool cakes prior to removing. Use a butter knife to go around each cake prior to removing. Make sure both cream cheese and butter are at room temperature. Sometimes I'll microwave for ten seconds to bring that temperature up. Mix cream cheese first until it's very smooth. Add in butter, mix until really smooth. Add in vanilla paste, mix. Add in half of the coconut. 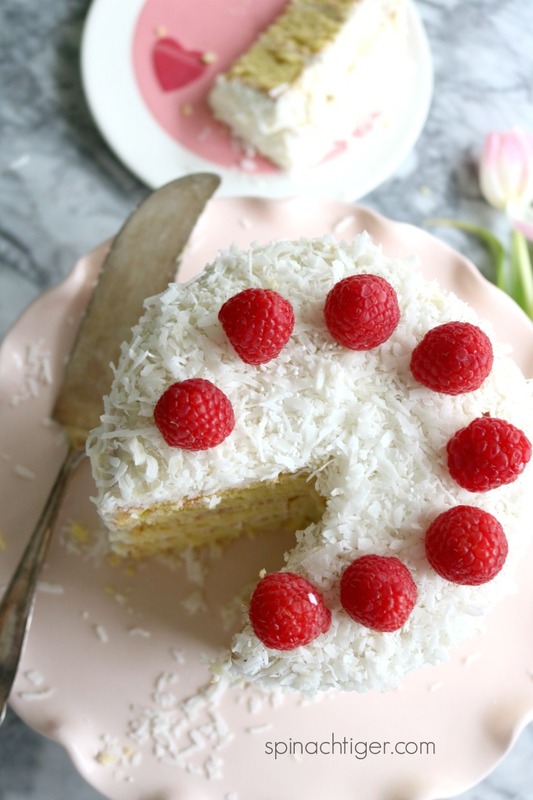 Reserve remaining coconut for topping the cake. Freeze the cakes on paper plates for about 15 minutes. You may need to use a bread knife to make the cakes even. I usually don't. Decide which layers will work best on top of each other. Frost each layer and save most for the top.You may not use all the frosting. You could use less and also make a naked cake not frosting the sides. I like to refrigerate this cake several hours before serving. Coconut Milk. I use the full fat. Make sure to shake the can well or put the contents of the can in the blender. You may even need to microwave for about 15 seconds to emulsify.